In the extreme North East of England, just off the coast of Northumberland, lies a small group of uninhabited Islands called the Farnes. Once famed for its shipwrecks and Holy inhabitants the Islands are nowadays well-known for their sea bird colony. 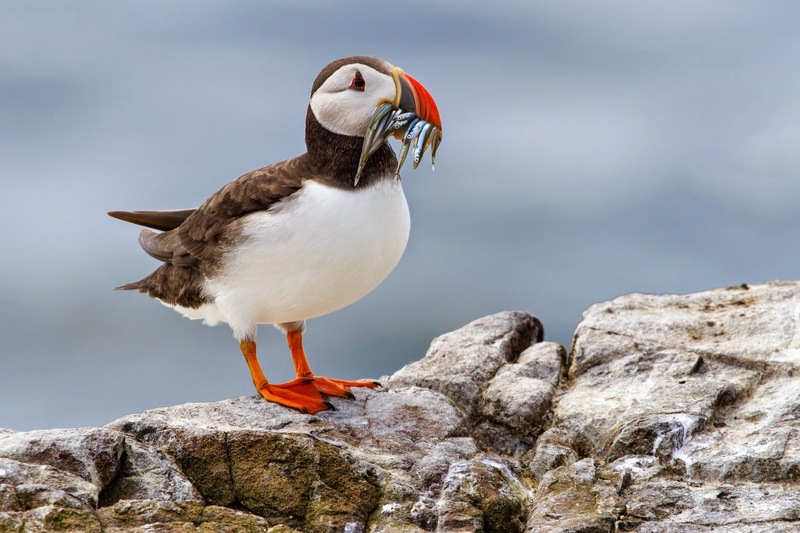 Between May and the end July the Islands are home to over one hundred thousand birds of which 35 thousand are Puffins. A combination of this and the ease of access to the islands via local boat companies make the Farnes the best place in Europe to photograph Seabirds. islands, Stable and Inner Farne. Sadly on the day I went, due to unexpectedly high winds, the boats couldn't land on Stable due to the swell. 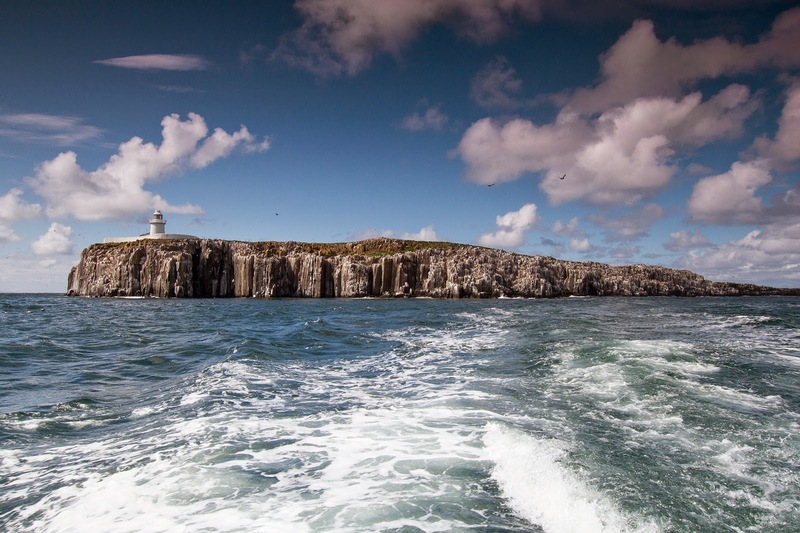 After a nervy 4 hour wait the wind dropped and I boarded the boat for the 30 minute journey across to Inner Farne. As you get closer to the islands the numbers of birds on view grow pretty quickly with Arctic Tern, Guillemot, Razorbills and Puffins skimming the boat. Because of a combination of sea spray and swell I chose not to attempt to photograph anything on the way over but in calmer conditions it would be well worth having the camera ready. When you land there are two things that hit you. Firstly the huge amount of birds and secondly the smell of the huge amount of birds! It can be very easy to be overwhelmed by the quantity of birds offering photo opportunities and with so many so close It's hard to know what to photograph. I'd strongly recommend that you go with a range of shots in mind as with only a limited time on the island it would be easy to miss a lot. I took the following to the Farnes and found that to have a Long telephoto, mid range zoom and a wide angle zoom worked great. 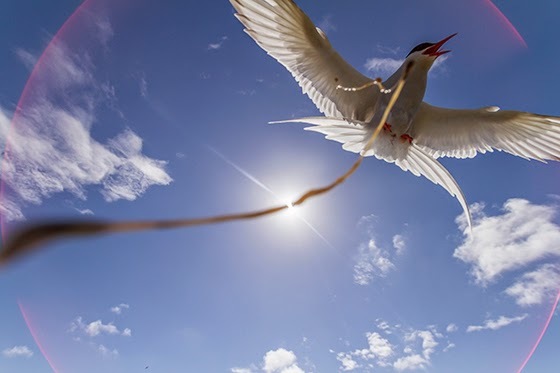 If you have a couple of lenses, I strongly recommend you take two bodies as one moment you can be photographing a Puffin with your telephoto lens, and then find an Arctic Tern landing just a few feet away that needs a shorter focal length. Despite most of the birds being only a few feet away, a longer lens (400mm-500mm) will came in handy to shoot some of the birds on the cliff edge. A telephoto lens will also be ideal when photographing them in flight as they return to the nest. A mid range zoom (70-200mm or 70-300mm) will cover almost all eventualities here. A 200mm is easily long enough for full frame shots. However one lens you must take is a wide angle zoom. The main reason for this is the Arctic Terns who like to show their dissatisfaction at you being near their nest by dive bombing you. This gives you a great opportunity to get a photo with a different perspective. The most impressive aspect I found with the Farnes is that, unlike most bird photography locations in the UK, here the birds come to you. Regardless of you being a professional, a semi professional or an amateur I can't recommend the Farnes highly enough. My trip was over all too quickly, but I still managed 2,500 photos and acquired most of the shots I wanted. 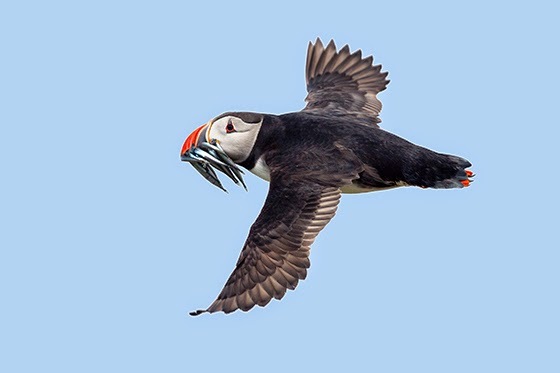 Here are my top 5 tips for photographing birds on the Farne Islands. Even in the middle of summer, the winds coming down the north sea can be pretty chilly. 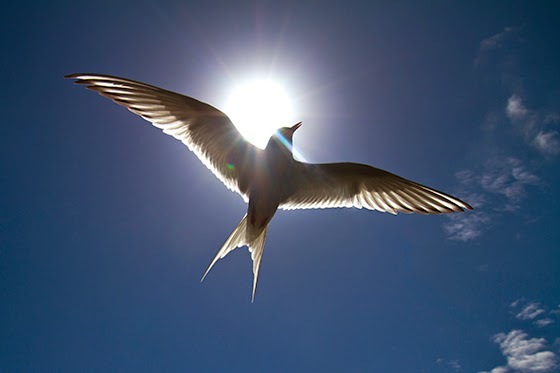 Another element to bear in mind is that you are very likely to be covered in Tern poo. It is both very smelly and can permanently stain so maybe leave the expensive coat at home. A hat comes in handy and in terms of footware the paths are made up of wooden board walks and jagged rocks so sturdy boots are a must. Also, there are no amenities on the islands so take some food and drink with you. The environment you’re photographing in is pretty dirty so a UV/Protector filter is a must. The most important time to have one on is when photographing the Arctic Terns - to avoid an unwanted “mess” on the front element. If you can it’s also a good idea to cover your lens with a plastic or neoprene cover as bird droppings can discolour rubber on some lenses. All of the birds on the islands are black, white or both! This is potentially an exposure nightmare. Beware that in bright light birds like the Arctic Terns and the white cheeks of the Puffins can be especially tricky to shoot. I found underexposing by roughly -1 solved this but it’s worth reviewing regularly to keep it in check. Also be cautious if you then change to photographing a Razorbill or Guillemot as the black plumage will require a lot of post production to recover detail if you shot it at -1 EV. On my trip I saw so many people with fully extended tripods shooting down onto the birds. By lowering your tripod or even laying on the ground to the eye level of the birds you can give your picture a much more natural feel. If, like I was, you are making your first trip to the Farnes the best advice I can give is not to panic. I’ve been photographing birds for over 10 years now and regularly spend hours sitting waiting for the perfect shot. The Farnes couldn’t be further from this. Try not to spend too long photographing single birds, move about and try and photograph as much as you can in the time you have available. If you want to learn more about wildlife photography and for some great deals on a range of photo kit, why not visit the Park Cameras stand at the The Rutland Birdfair between 15th and 17th August. You’ll find us at Stand number 8 in the Outdoor Display. You can purchase tickets in advance from www.birdfair.org.uk. Alternatively you can visit either our Burgess Hill or London stores, or call 01444 23 70 70 where a member of our expert team will be happy to help. Please see below for some of my favourite shots from my trip, along with some detail about each one. This is one of the shots I really wanted to get. By the end of June the young Puffins are just hatching and the adults are busy try to satisfy their hunger. They regularly fly in with beaks full of Sandeels before disappearing down their borrows. 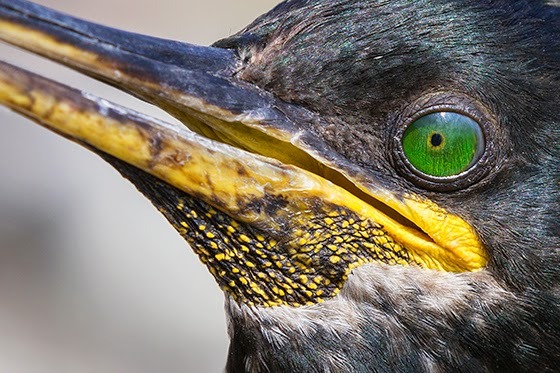 Shags breed right on the edge of one of the main paths allowing for some interesting photography opportunities. I used the 70-200mm to get a close crop of the head and its beautiful eye. Taken at 10mm! Because they fiercely defend their nests they will allow you to get close. Sometimes too close. Demonstrating why a filter is an essential! I only managed to find two acceptable shots out of the about 800 flight shots that I took. The best place I found was the south west corner where, due to the northerly wind on the day, the Puffins were coming off the sea with their catches. 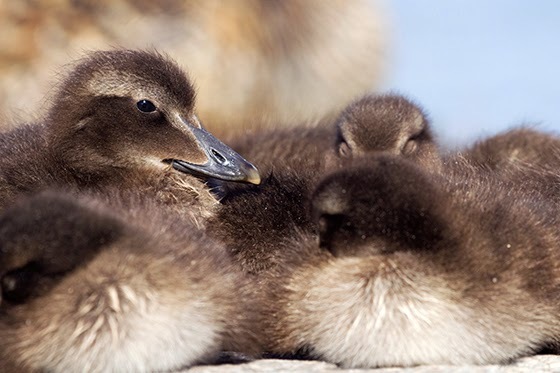 Before you leave it’s well worth looking in the harbour at Seahouses – it’s often a haven for Eider families. Going to the islands tomorrow. Thanks for the advice. Thanks for all the "tips" I will be there in June 2018. Thanks, great advice. If you are going with a keen 11-year-old wildlife photographer would you recommend just Inner Farne or is Staple ok too? Mint advice Marc. I'm going tomorrow for the first time.